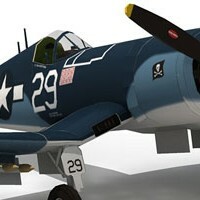 This F4U Corsair paper model template is one of my design that was derived from my foam RC plane plans. I made a 1:8 scale model of this aircraft that can really fly made out of depron foam. Many friends wanted a paper model version of it so I made this. Designing paper model template is pretty similar with designing plans for my RC plane, but making paper model template is a lot harder. In paper model you still need to add color while in RC plane you can apply color with paint. 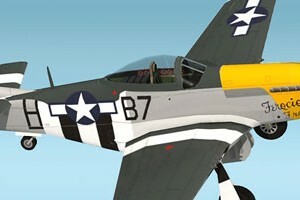 The scale of this template is 1:33, the same scale as my previous P51D Mustang. The reason I make this template is Corsair is a beautiful and unique plane. I already fan this plane since I was a kid, there was a TV series titled "Black Sheep Squadron" back in 80s. I love watching that show on every Sunday at noon. The show was made from the real history. That squadron is lead by Major Pappy Boyington and based on an airstrip in one of the pacific island. While the livery I choose for this paper model is based on carrier and one of the "Jolly Rogers Squadron". You may look it familiar, the look is pretty similar to "Skipper", a character from Disney Planes animated movie, it's because Skipper and his Squadron, the Jolly Wrenches is a parody from the real Jolly Rogers Squadron. Number 29 is piloted by Lt. Ira Cassius "Ike" Kepford, an ace pilot with 16 confirmed kills on Japanese aircraft. 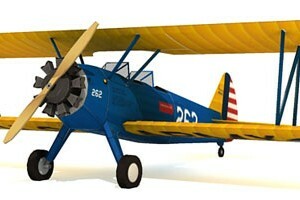 This is a model of Boeing PT-17 Stearman, from WWII era. A biplane from 40s, it was used as a trainer plane for many US fighter pilot. Now the plane use for acrobatic shows, private owned or even for crop dusting. I always combine many my hobbies into one if possible. As you may have know on my Facebook I've been busy experimenting with my new hobby, scratch building an RC plane using foam. The design method for foam aircraft model is pretty similar to paper model template version, but it's already simplified even more. I re-use the 3D model for making paper model template. The scale is 1:40 the same scale as the existing Wilga model. The template use formers and inner glue tabs, so you need to provide 2 kind of paper. You will need cardboard for its formers/ frames and 100 gram paper for the skins. America has "The Red tails" Mustang in World War II, We have "The Red Beak" Mustang or "Cocor Merah" in translation. While Red Tails is a nickname for P-51D Mustang that belong to USAAF 332d Fighter Group or Tuskegee in 1944, Red Beak is also a nickname for ourAir Force (AURI) Mustang in 1950s. AURI got them from The Kingdom of the Netherlands, but the irony they also used to fight off the Dutch from us in later confrontation in mid 1950s. The Mustang still used by the AURI for various military operation until they were grounded in early 1970s because of the aircraft are getting old and lack of spare parts support. This paper model template was recolored by Dani Hamdani, model on the photos were built by him. I am an aircraft lover since I was a kid, Wilga caught my eye when I visit Satria Mandala Museum. There is a Wilga or Gelatik in that museum as a static display, it can't fly anymore, the color is yellow. It was belong to TNI AU as a utility aircraft. I need a simple plane to make in to paper model, so I remember I did took some photos of Gelatik. I was going to use those photos as references but unfortunately some photos are out of focus. So I google it and decided to make a 35A version (PZL-104 35A) because it looks like more popular than the 2C version (Gelatik). The paper model shapes are quite simple, just 2 pages of patterns, but there are few of small parts. To fit its wing template in A4 paper so I make the scale of this model aircraft 1:40. This is the second times I ever designed a paper model template using cardboard as former, the first one is a commercial model and also a plane. 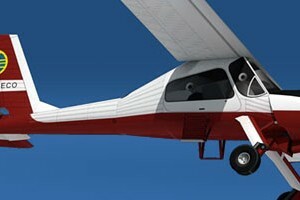 This model is different from the rest of plane models that are found at paper-replika.com. There are almost no glue tabs or glue flaps on this template. So how can we assembly the parts if without glue flaps? That's why this template needs another paper type, we need 1.5 mm cardboard for the plane skeleton and 150-160 gsm plain paper fo the aircraft skin. We will use cardboard edge to join one part to another. I already made a preliminary build on this model and I already made an adjustment and this is the final ready-to-build template. 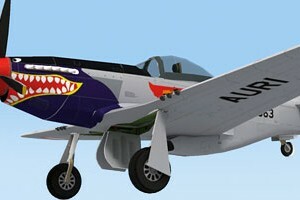 The reason I made this Ferocious Frankie P51D Mustang model is because its color, the color combination is very eye catching to me. Also I have an RC plane with this color scheme, it's so beautiful. There will be another color scheme in the future using this template as a base. The scale is 1:33, the built model will have 37 cm (14.4 inches) wingspan.